DESCRIPTION – .75 inch Flat Lace, hunter green. $0.171 ea. $0.128 ea. $0.120 ea. $0.113 ea. DESCRIPTION – 1 Inch Flat Raschel Lace. Made of 100% Polyester. DESCRIPTION – 1.125 inch Flat Lace, hunter green. DESCRIPTION – 1.375 inch Flat Lace, hunter green. $0.58 ea. $0.406 ea. $0.348 ea. $0.290 ea. $0.261 ea. $0.247 ea. $0.232 ea. $0.218 ea. DESCRIPTION – 2.5 inch Flat Lace, hunter green. $0.62 ea. $0.434 ea. $0.372 ea. $0.310 ea. $0.279 ea. $0.264 ea. $0.248 ea. $0.233 ea. DESCRIPTION – 3.25 inch Flat Lace, hunter green. $2.91 ea. $2.037 ea. $1.746 ea. $1.455 ea. $1.310 ea. $1.237 ea. $1.164 ea. $1.091 ea. DESCRIPTION – MADE IN THE USA. 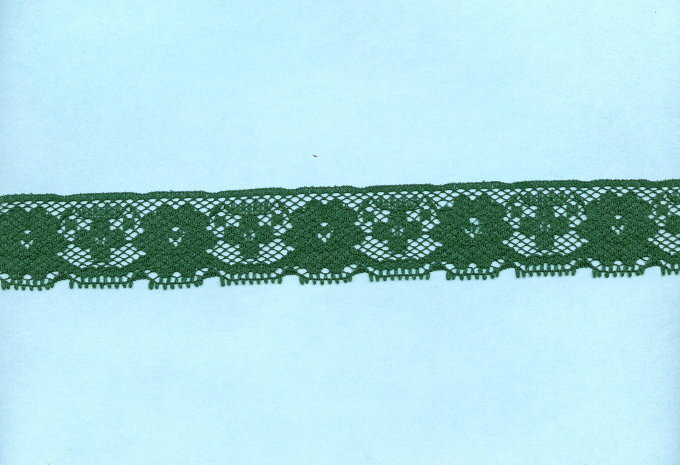 6.25" Flat Raschel Lace. Unknown fiber content.